Looking for the summer Colonial Faire event? Click here for information! 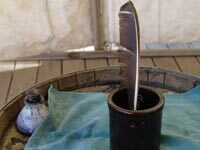 Explore the domestic, agricultural, and cultural heritage of Colonial America with hands-on workshops! Though the years just prior to the American Revolution were certainly full of turmoil, the people of the colonies worked hard and found time for a some fun, too! 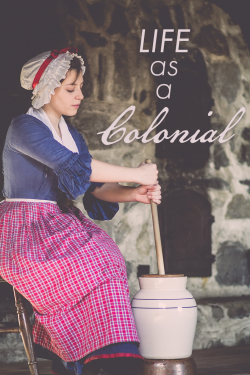 This tour explores the domestic side of 18th century America and puts students in the shoes of their colonist counterparts in a fun, interactive way. Look on the Itinerary page for an idea of the workshops you might try during your two-hour tour. 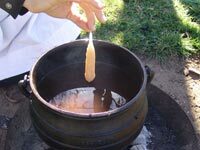 Make your own taper-candle to take home with you, learn about the types of waxes used, and be entertained by lore from a time before light-switches. 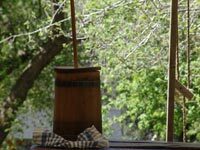 Churn some sweet cream butter in our Summer Kitchen, learn how our dairy cows are milked and cared for, and gain firsthand knowledge of how to make your own butter at home. As a young man of not yet sixteen years of age, George Washington copied a set of proper 18th century social behavior. Learn proper manners and be tested on your knowledge. Wool and Flax are the main fibers used to make our clothing. 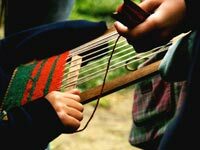 Try your hand at carding wool and using a hand loom. 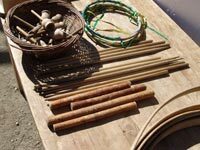 When chores were finished, the colonists had entertainment such as the Game of Graces, Trap-Ball, and Hoop and Stick, so take a break and try your hand. Like most of our programs, we need a minimum of 50 people to schedule a tour. Once that is met any size group can add on up to our maximum of 560 people. There is on site food at the Bakery and Restaurant which can be ordered or purchased throughout the day. Most schools bring lunches for the students, and you will have access to a picnicking area for lunch. This tour is great for all ages, but is most appropriate for pre-K through 4th grade. Do I need to teach my students anything specific before our field trip? This program focuses mainly upon interactive activities and is comparatively lighter on historical fact than most of our other tours, so just be prepared to come enjoy your time here! Do I need to group my students a certain way before our field trip? Like our Revolutionary War program, we place our guests into “townships” of roughly 35, including adults. It is not at all necessary to do so ahead of time, but will save a few minutes upon your arrival, if you wish to do so. All of our tour leads are prepared to greet and assist you when you arrive. They will provide you with all necessary paperwork and directions, and assist your students with lining up into straight lines behind the township flag for your group(s). Large groups need reservations, but individuals may join a tour in progress if space is available.